ARAVAIPA - Where ADVENTURE KNOWS NO BORDERs. If you live in a floodwater tunnel beneath the busy streets of Nogales, you don’t have much of a life. Your only chance is to get to the end of the tunnel – on the other side of the border. In the mid-1990’s, Santiago Molina, a Tzotzil boy from Chiapas, sets out through Mexico to the two cities of Nogales separated by the U.S.-Mexico border in Arizona and Sonora. 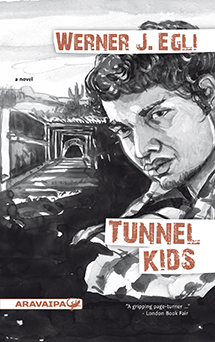 Leaving his childhood behind, the road he follows turns into a nightmare, leading him to the tunnels that harbor kids like Santiago, most of them without a future – but still with a dream. "Books like Tunnel Kids are especially important right now as immigration to the United States is becoming more of a flash point in political discourse and politics. Stories like this remind uns that most of the immigrants comming zo the US are seeking safety and a better life, not a free ride." - Heidi Komlofske-Rojek, San Francisco Book Review.